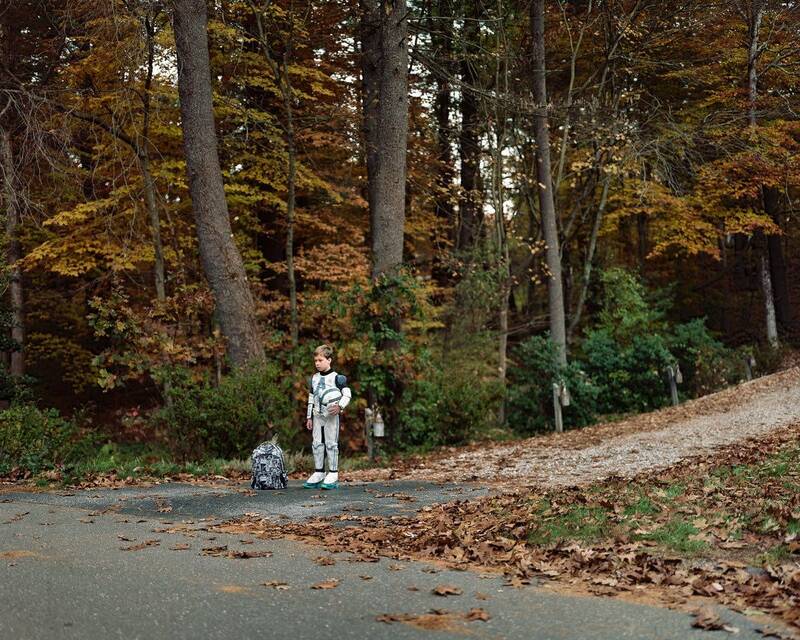 As children wait for their morning bus to school, photographer Greg Miller is there, too, capturing their solitude. His subjects are young: Some of them are heading to classrooms where the days of the week and instructions on telling time decorate the walls. Waiting quietly for their bus, they trust they are safe. Miller says he used to see his daughter's school day as "another lifetime," beginning at the end of his driveway and ending on her return home. Now, he says, as he watches her bus disappear down the road, he hopes her life doesn't end between those hours. 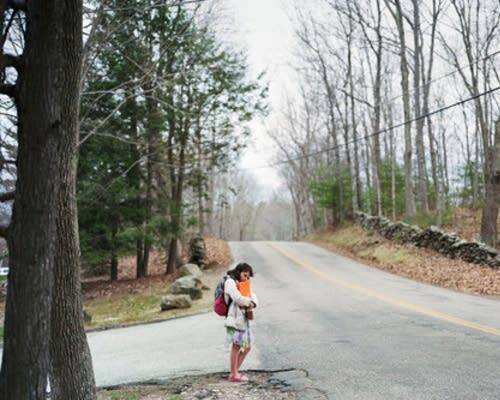 His recent series, "Morning Bus," explores that terrible hope through capturing the quiet of children as they wait for their bus. "My hope is that there is a little bit of the magic of the early morning present in my pictures," Miller says. "Like in C.S. 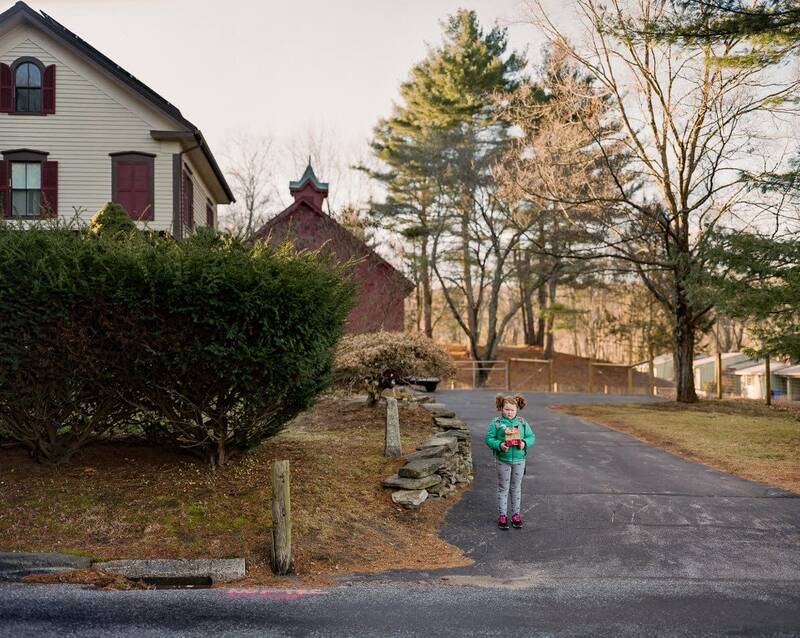 Lewis' Narnia, by photographing children who are really waiting for the bus, there is a mixture of vulnerability, childhood wonder and real-life anxiety." He tells NPR about the project. 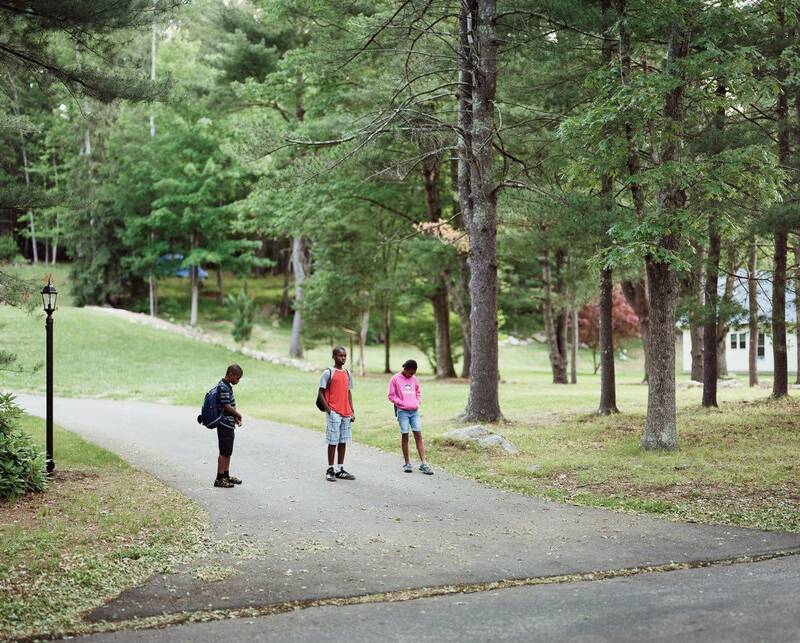 I had the idea to photograph kids waiting for the morning bus in 2012, a couple of years after moving to our town in northeastern Connecticut from Brooklyn. The rural roads were still unique to me. My own daughter was in elementary school, and we would stand together and wait for the bus in the mornings. One winter day on an early drive to the airport, I saw other children waiting for the bus there in the darkness — lit only by the headlights of my car. That was when I had the idea to make a series of photographs, but how? On Dec. 14 of that year, I was devastated, like most people, by the news of the Sandy Hook shooting. Newtown is only an hour or so drive from where we live. My daughter was 6, the same age as many of the victims. I was asked to go down to Newtown the day after the shooting by a magazine. Because I live in Connecticut, they said, "See what you can do." I was one of many, many members of the media who descended upon that town — but there was no picture to be made. It was nauseating; there was a feeling of hopelessness, helplessness. There were maybe 10 members of the media for every resident of Newtown. I thought the best thing for everyone would be for me to leave. When I came back, I was haunted. I couldn't shake it. This became the impetus to start the work. In Newtown, I saw newspapers filled with the faces of those neighborhood children — the grid of photographs of victims' faces that appear on newspaper front pages whenever a tragedy like this happens. It's the quickest and most efficient way of describing who died, but it doesn't even begin to explain the tragedy or give us a sense of those people. If you think of those grids, the idea that each one of those squares is a whole person, a life — what if we were to stop everything and just look at each one of those people? It wasn't until 2013 that I started making the first photographs, but I've been making photographs, on and off, every year since, for five years. I've now made about 25 portraits. What do you hope will resonate or stick with people the most? While this began in response to the Sandy Hook shooting, it has taken on even greater significance with each school shooting. 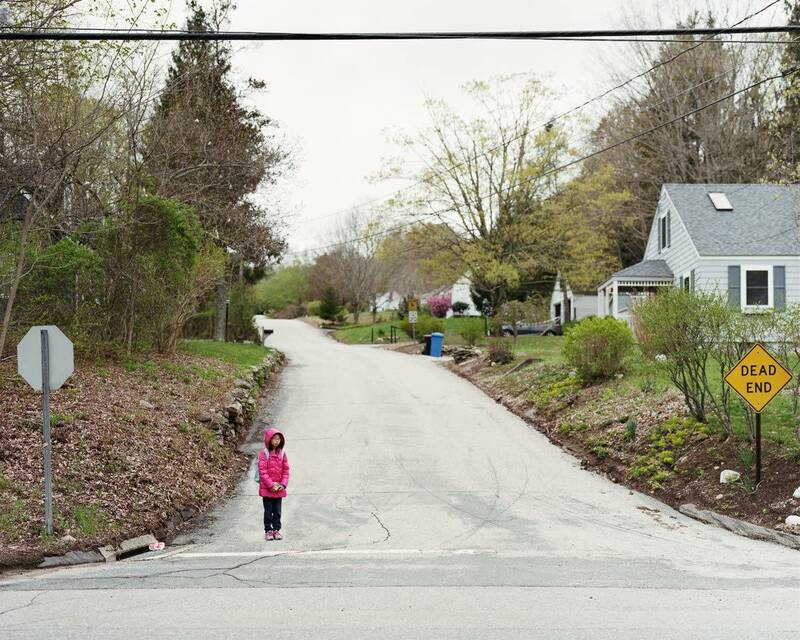 But in the end, these photographs are simply of children waiting for the morning bus. My intention was to take something that is universal, an experience we all have had either as a child ourselves or as a parent of a child. I am not trying to politicize it. I am a humanist, and it is obvious to me that our society is trending towards dehumanization, but I feel we only lose each other when we preach at each other. My hope is that these pictures will communicate something that words can't. How did the kids react when they found out you were taking their pictures? What did their parents think? I explain my project to parents days in advance and if they are interested in being in the series, I ask the child if they are also interested. We agree on a day, and I show up that morning about an hour before the bus arrives so I can set up. The child or teenager then comes out about 20 minutes before the bus arrives — if I'm lucky! Some come out five minutes before the bus arrives. When the bus comes rumbling down the street, picks the child or teenager up, that's it, session's over. I started the project with my own daughter, then the kids of our friends, then the kids of friends of friends. The kids really are waiting for the bus, but they are also aware they are being photographed. I know it might look like I jump out of my car and ask kids or parents if I can take their picture, or worse, I don't say anything, but that couldn't be farther from the truth. It is all very intentional with plenty of notice. One time I had a young photographer call me on his way to being questioned by the police because he had tried to photograph kids waiting for the morning bus without giving advance notice and the parents had called the cops on him. I shared with him my process. I think it's better. 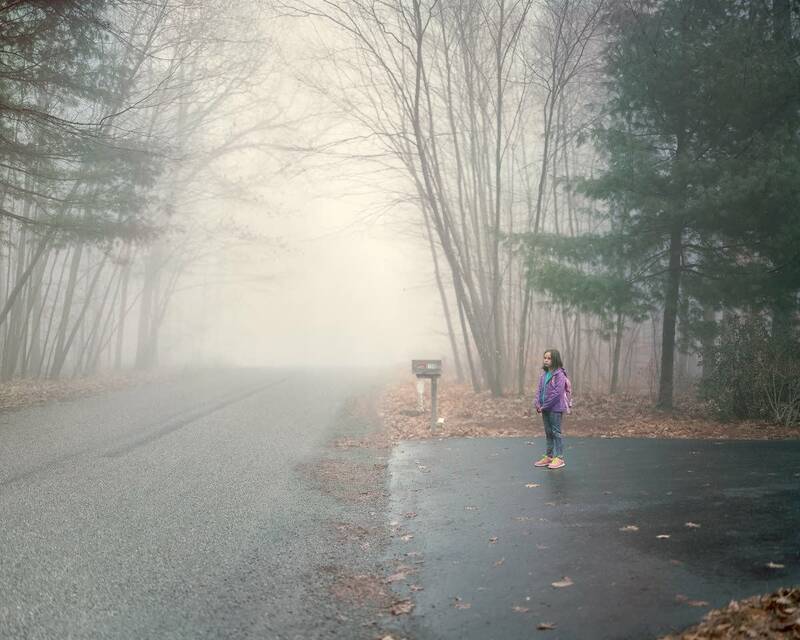 I am partial to the photograph of my oldest daughter in the fog. My connection to her and her proximity to the age of many of the victims was what made me want to do this project. 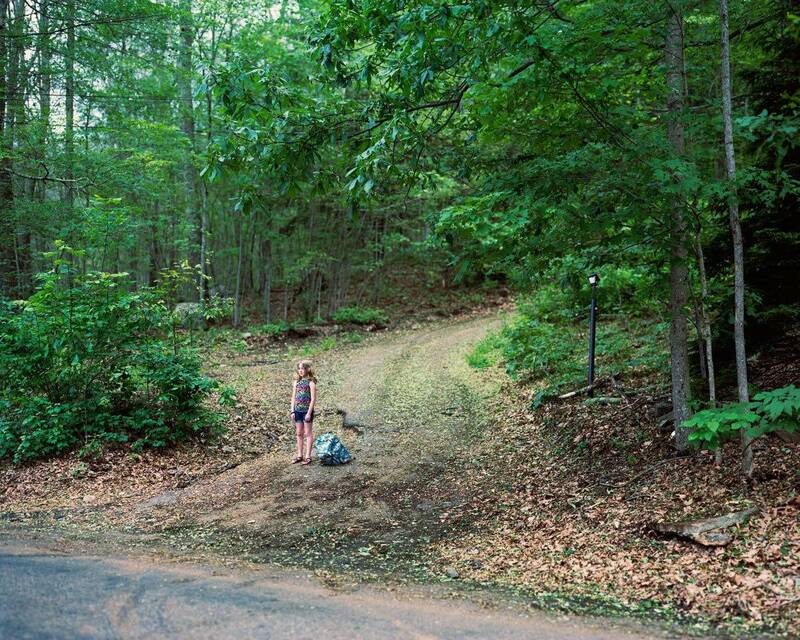 I also love the photograph of Carly standing in the woods. Dana was so excited to be photographed that she wore her spring dress even though it was still winter. 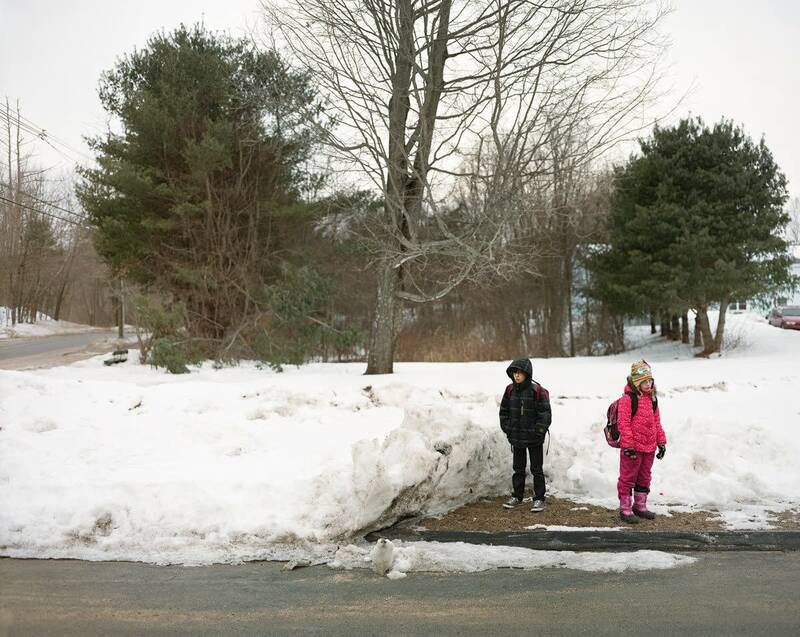 Since I am photographing at the time they are waiting for the bus, whenever that is, the light is sometimes an issue. The road itself is often in the way. The picture always seems better from the middle of the road. Also weather is a factor. If the child has to stand in the rain, I feel I should stand in the rain. I want the viewer to have the experience of the children in the pictures. What format and equipment did you use and why? All the photographs are made on film with an 8-by-10 view camera. I have been working with that camera for a long time. It's my preference because, among other things, it has shallow depth of field which seems to capture time as well as space. There are other benefits, such as extreme sharpness, but the real reason I use this camera is because the photographs are simply beautiful. Do you plan to do anything else with this project? My 5-year-old, who enters kindergarten this year, has expressed interest in taking the bus. I plan on photographing her as soon as the school year begins.